As Commonwealth Heads of Government met in Nigeria, the BBC's Peter Biles sent a regular diary. The summit is over. Dan Isaacs of the BBC World Service has done his last radio broadcast from the open thatched shelter that he has been using alongside the media centre. A local potter, Daniel, has just completed a touching dedication to his namesake. He's moulded the words "BBC Radio Bush Hut" in clay on the wall. To the bitter end, the bad-tempered Abuja summit was completely overshadowed by the Zimbabwe crisis. As the red carpet is rolled up outside the main entrance, we receive news that the pariah president, Robert Mugabe, has flown to Switzerland to attend a UN information summit. South Africa's president, Thabo Mbeki, is keeping his head down and has passed the buck. No comment from him today about Zimbabwe's pull-out from the Commonwealth. Instead, says Mr Mbeki, Lesotho will make a statement on behalf of Southern African Development Community. But it will not be made here in Abuja. The next Commonwealth summit in Malta in 2005 will be a contrast to our Nigerian experience. Nigeria is a country of 120 million people. Malta has a population of just 386,000. It is a perfect example of the Commonwealth's diversity. Not much sleep last night. The Commonwealth spokesman, Joel Kibazo, came rushing back to the conference centre at midnight to respond to Zimbabwe's withdrawal. We continued broadcasting live until the early hours of the morning. The Zimbabwe Government never hides its disdain for the BBC, yet last night, the government spokesman in Harare, George Charamba was desperate to talk to us. "Let me read you our statement right now", he shouted on his mobile phone. The media centre is buzzing this morning. The final news conference is due to start shortly. Caribbean and Pacific leaders are said to be fed up that everyone is talking about Zimbabwe and little else. Chatting to Sekai Holland, a spokeswoman for the Zimbabwean opposition - MDC, I remind her that at the last CHOGM in Australia in March 2002, she predicted the MDC would be in State House in Harare within two weeks, just after Zimbabwe's elections. She laughs loudly. "We're still hoping", she says. It's been a terrible day for the Commonwealth. Hours of acrimony as the leaders tried to reach a deal on Zimbabwe. A draft document was produced at 3pm but everyone wanted a say. Eventually just before 8pm President Obasanjo of Nigeria and the Commonwealth Secretary General Don McKinnon announced that Zimbabwe would remain suspended from the Commonwealth. Some of the African countries were angry that Zimbabwe had not been re-admitted. Then, three hours later, a terse one-line news agency report from Harare: Zimbabwe would be pulling out of the Commonwealth with immediate effect. Robert Mugabe had followed through on his threat to leave the family of 54 nations. Now the Commonwealth is left wondering if Zimbabwe's allies might follow suit. Around lunchtime, there is the first hint of breaking news. British officials say the six-member committee which has been discussing Zimbabwe is divided. It cannot agree on how to deal with Zimbabwe's suspension. UK Prime Minister Tony Blair may have to delay his planned departure from Abuja this afternoon. If there is no consensus, it is going to be bad news for the Commonwealth. The Commonwealth leaders and their spouses have disappeared for 24 hours to hold private, informal talks. In CHOGM jargon, this is known as "the retreat", but the days of jetting off hundreds of kilometres to a swanky safari lodge or a luxury coastal resort are long gone. This year, the presidents and prime ministers are closeted away in a Nigerian presidential guesthouse here in Abuja. While the heads of government are away we, too, are being invited to relax and enjoy ourselves. A special tour of Abuja has been arranged for journalists on Sunday morning. The itinerary includes a visit to Millennium Park, the Ushafa Pottery Village and the Lower Usuma Dam. Let us hope the building work is finished at these places. The familiar question of the Commonwealth's relevance surfaced again on Saturday. The secretary general, Don McKinnon was asked at a news conference how he thought Zimbabwe's president, Robert Mugabe, regarded the Commonwealth. "It certainly seemed a relevant organisation to Mr Mugabe, when he stood on the steps of State House in Harare the other day and announced that he wanted to come to the summit", replied Mr McKinnon. The Commonwealth flags are streaming in the tropical breeze this morning as the leaders arrive for the Third Executive Session of this CHOGM. The flags are a glorious sight but it is always a stiff challenge identifying the smaller nations such as Tonga and Tuvalu. The Namibian flag is the most prominent; it's become hooked around the Malaysian flagpole. Inside the Media Centre, Tony Blair's official spokesman has convened "a huddle" to brief the British press. Mr Blair is planning to leave CHOGM early, on Sunday night. Asked whether the thorny issue of Zimbabwe might still be unresolved and under discussion while the British prime minister is on his way home, the spokesman replies: "We are instantly adaptable." We are hoping for an improvement in the catering service today. Last night's over-priced dinner in the media tent was truly dismal... a choice of one minuscule piece of chicken or four small cubes of beef, with dry bread. The rice had run out by 2000 (1900 GMT). In desperation, we all asked for double rations but were given stern looks of disapproval by the catering staff. The mingling begins in earnest this afternoon. A lunchtime reception hosted by the Commonwealth Secretary General, Don McKinnon, is the perfect opportunity for us to take a few early soundings on Zimbabwe. With a plate of nibbles in one hand, New Zealand's Prime Minister, Helen Clark, is encircled by a throng of reporters. But most of them struggle to get within earshot, as she quietly explains the latest diplomatic wrangling over Zimbabwe's suspension. Other Commonwealth leaders are less keen to linger at the party. Tony Blair and Thabo Mbeki make only the briefest of appearances. After lunch, the press kits (aka: "goody bags") are handed out to the media... always an eagerly-awaited event at these international summits. The black shoulder bag with the CHOGM logo is standard issue. Like a Christmas cracker, the contents are what everyone is interested in. There's a large glossy book on Nigerian art, a CD-ROM entitled "Nigeria: The Journey So Far", and a booklet about President Olusegun Obasanjo subtitled "Service To Humanity". The Commonwealth summit opened in traditional style, with a festival of Nigerian culture exploding on the stage in front of the assembled dignitaries. The dark suited leaders of Commonwealth countries looked sombre and incongruous as they watched the actors and dancers in the most extravagant Nigerian costumes. In his speech the Commonwealth secretary general Don McKinnon described the modern Nigerian capital Abuja as a "fascinating and exciting city". My own impression: a town planners nightmare, with hardly anything - buildings, roads or bridges - that looks even vaguely complete. As the opening ceremony unfolds there's a brief video snapshot of Nigeria's history. The voiceover refers to the country's "chequered past", as images of former military rulers, including the notorious General Sani Abacha, flash across the screen. 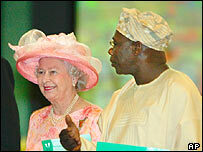 Queen Elizabeth said this CHOGM was an "unmistakably African occasion". She's right. It's wonderfully vibrant, colourful and chaotic. The Nigerian hosts are relishing this opportunity to showcase their country to the world. It's the first full day of the Queen's state visit to Nigeria. We brave the traffic in the morning rush hour to head out to Karu, 20 miles from Abuja. The Queen is there to see a new project called Voices, a radio drama set in an African market place. It's designed to raise issues of everyday concern to Nigerians, such as HIV/Aids, education and corruption. There is a colourful and flamboyant welcome for the Queen from local dancers, musicians and schoolchildren. The musical instruments look old enough to have been used in the Queen's last state visit here before independence. There's a touching moment when the Queen meets Folashade Randle, who at the age of four presented flowers to the Queen in 1956. "Not in my wildest dreams did I think I'd meet the Queen again, 47 years later. It's been a glorious day," she said. At sundown we gather in the garden of the British High Commissioner's residence in Abuja for a grand reception hosted by the Queen. At least three former Nigerian presidents are here, along with Royal Fathers, some of Nigeria's senior traditional rulers. It's a Who's Who of the great and the good in Nigeria. Amid all the acrimony, Nigeria's president came out of the Abuja summit looking good. Time running out for Mugabe?